In June 2011, the USDA released a new food icon to promote healthier food choices in an easy-to-read format. The graphic was designed to replace the MyPyramid icon released in 2005. 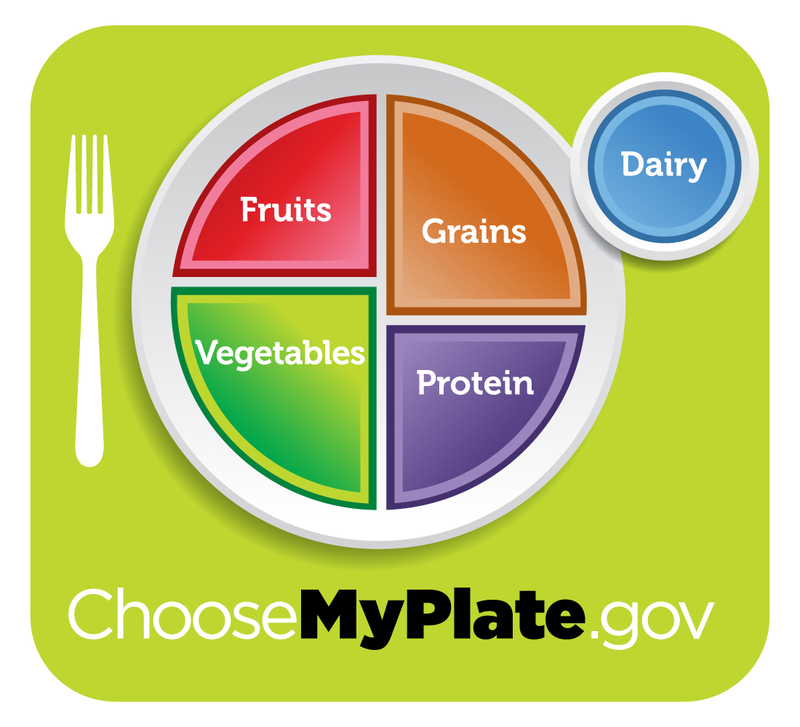 MyPlate is composed of a dinner plate divided into four sections – fruits, vegetables, protein, grains – and a glass of non-fat or low-fat dairy on the side. The goal of the icon is to promote healthier food choices through a balanced diet composed of at least 50% fruits and vegetables, 25% whole grains, 25% lean protein, and a small amount of fat-free or low-fat dairy. Focus on choosing fruits and vegetables as 50% of your plate. Aim to make at least ½ of your grains whole (such as whole wheat, bulgur, oats, brown rice, etc). Choose lean protein including lean beef, white meat poultry, seafood, beans, seeds. Choose fat-free or low-fat dairy products to prevent consuming excess calories and saturated fat. The website associated with the icon, www.ChooseMyPlate.gov, allows consumers to use a Super Tracker to personalize their eating plan. The Super Tracker uses age, gender, height, weight and physical activity level to determine an individualized nutrition and physical activity plan. These variables are used to determine the number of servings you need from each of the five food groups and also allows for a number of empty calories to promote a balanced diet for weight loss or weight maintenance and disease prevention. The website allows consumers to track foods and physical activity to monitor progress. 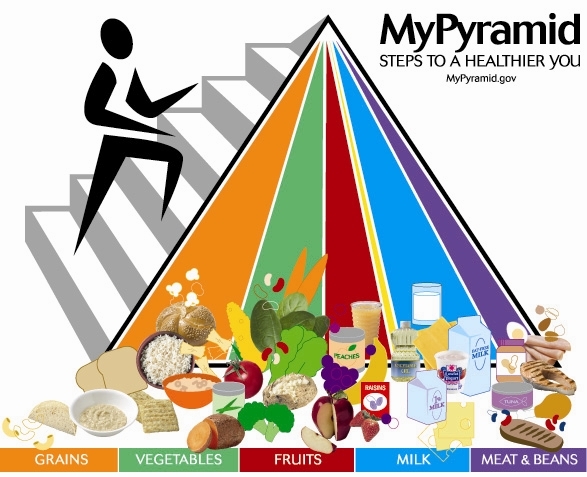 In 2005, MyPyramid replaced the old Food Guide Pyramid in an effort to make healthy eating more personal and realistic and to encourage physical activity into a balanced lifestyle. The website associated with the icon gave detailed information about how to use the icon and how to incorporate its recommendations into one’s diet. Unfortunately, the icon itself was not easily understood and required consumers to visit the website to obtain the information and recommendations it promoted. Relying on the website to provide essential information assumed not only that all consumers had access to the internet and a computer, but also that all consumers would actively visit the website on their own time. MyPlate aims to provide an icon that is familiar to consumers and easy to understand. It uses the image of a plate, sectioned into recommended portion sizes for the five food groups, and color coated according to familiar colors associated with each food group. The website is supplemental to the icon, but is not essential to understanding the icon itself. Balancing calories by aiming to only eat the amount of calories that one’s body needs with respect to physical activity and lifestyle. Incorporating more physical activity into your day by taking the stairs, parking the car further away from the door, or carrying groceries into the house 1-2 bags at a time. Enjoying food by focusing on its taste, texture and smell, slowing down while eating, and limiting distractions such as eating in front of the TV or while driving. Being mindful of portions by using smaller plates and using the MyPlate icon as a personal guideline. Limiting highly processed foods and foods high in solid fats, added sugar, and salt.